This bathroom tap of the GROHE Eurodisc Joy range comes in a clean, elegant look with the glossy, hard-wearing GROHE StarLight chrome finish. Its stunning design is complemented by an excellent functional performance. The medium high spout is ideal for filling tall containers and allows you to wash your hair in the basin with ease. Thanks to the GROHE EcoJoy water-saving technology, your water consumption will never exceed 5.7 litres per minute, thus conserving the environment while going easy on your wallet. The GROHE FeatherControl cartridge ensures a smooth and effortless control of water temperature and volume just with a fingertip. With the GROHE QuickFix Plus system, the installation of the tap is rapid and hassle-free. Limescale deposits are no longer an issue with our SpeedClean anti-lime system. The elegant waste solution. A discreet lever at the back of the tap lets you close the waste to fill the basin and pop it open to drain without putting your hands in the used water. Simplicity and comfort in one neat feature. Get the bathroom spout just right. neither too tall or too short, GROHE’s medium height spout gives plenty of clearance for kids to brush their teeth, and it lets you get more use from the bathroom basin. Having a GROHE SilkMove cartridge in your taps is the ultimate convenience. 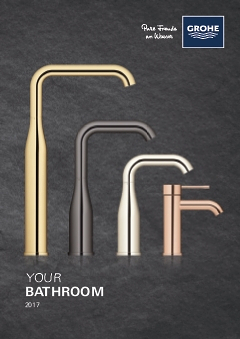 You can vary water temperature and flow with barely a touch of the handle, and GROHE’s superior German engineering and craftsmanship means it will work as brilliantly for years to come. GROHE Starlight chrome coating on taps means you can just wipe them down with a dry cloth – no marks, no streaks, no water spots. The ultra-bright surface is scratch-resistant so will keep its original lustre with minimal maintenance. GROHE EcoJoy reduces the amount of water your tap uses by up to 50%. The really clever part is that thanks to the tap’s internal technology you still get a full jet of water every time you turn on the tap. Save water and money without compromising on comfort. The GROHE QuickFix Plus system includes an innovative nut with a special threat that makes fitting easier and faster – it cuts the standard installation time by up to 50%. Fit your taps hassle-free using our easy installation system. Taps are connected to the mains by flexible hoses – much simpler to get a grip on – and our step-by-step guides take all the stress out of the job. Even a professional fitter will thank you for choosing Easy Installation.